Your people are your greatest asset. To secure these assets, you need to identify and track the best applicants for each job. TimeForge Applicant Tracking and Onboarding lets you customize workflows to ensure every applicant has a consistent experience. You can simplify and organize your hiring and onboarding process with at-a-glance dashboards. When you have the right people in the right jobs, your business is primed for success. But if your hiring process is disorganized or takes too long, you might miss out on great people. 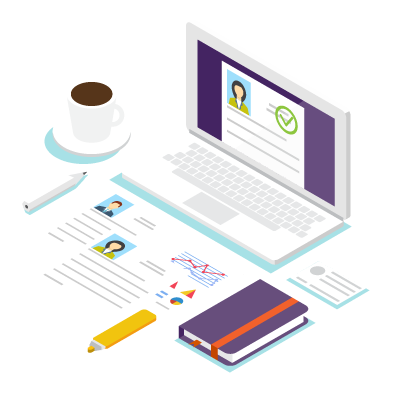 Our applicant tracking solutions keep your jobs and candidates organized with automated workflows, at-a-glance status updates and integrated candidate messaging. Customize job titles and descriptions and set screening questions for each posting to help identify the most promising applicants. Rate and rank candidates within the program to facilitate discussions among decision makers and to keep the hiring process moving. Then seamlessly move new hires into the onboarding process. NEED HELP MANAGING YOUR WORKFORCE? TimeForge brings scheduling, payroll, vacation requests and more into a single portal that easily integrates with your other systems.